On the day of his parent’s heist, Atlas Rollins knew little about money or the claws it had latched into his parents. He did not know the words “armed and dangerous” or “at large” or “assailant.” In fact, in the minutes before the police officers found him and his older sister Mary in the back of their minivan, Atlas was too busy eating cherry-shaped fruit snacks and singing along to “Norwegian Wood” to be bothered with what his parents were doing in the bank or why they left with very heavy canvas bags instead of their normal checkbook and purse. “Are your parents Craig and Christiana Rollins?” he asked. The man was fat, that much Atlas could see from his view below the window ledge, and had a bushy brown mustache that looked like curtains. “Why do you ask?” Mary said, elbowing Atlas to make sure he was in on the joke. “I’m sorry, Mr. Policeman, but my mom told me never to open the car for strangers.” Mary settled her bony shoulders back into the leather seat and went back to reading her book, taking a glance at the policeman every few seconds to make sure he was still paying attention. 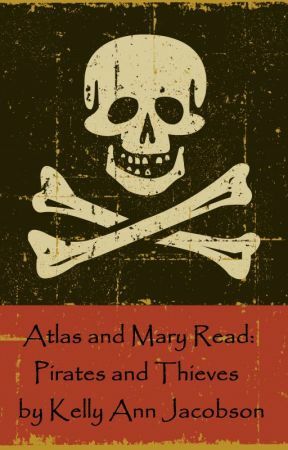 Starting on 8/24, author Kelly Ann Jacobson will post a new chapter from her Wattpad exclusive book, Atlas and Mary Read: Pirates and Thieves, every day. Check back tomorrow for more!